Shock absorbers are an extremely important component of any car, as it provides you with a comfortable ride no matter where you want to go. Well, the boffins at Cambridge, MA-based Levant Power have come up with a new form of shock absorbers which are touted to lower fuel consumption by 1.5% to 6%, depending on the type of vehicle it is used in and driving conditions. Not only that, the new shock absorber system is touted to improve vehicle handling for motorheads who place a great amount of emphasis on performance. Apart from that, what sets this shock absorber system apart from the rest in the market would be its ability to take advantage of potholes – assuming you could not avoid one in time, it will be able to turn the situation in your favor, turning vibrations and jolts from rough roads into electricity. Levant has already run demonstrations of its technology in road tests with a Humvee, and they hope to expand testing to trucks, buses, and other vehicles later this summer. 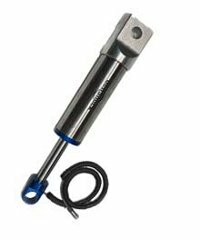 The shock absorbers do not look out of place at all, being pretty much conventional ones from the outside, although you will find a power cord coming out of one end. It can be retro-actively installed in ordinary vehicles by mechanics, and will come plugged into a power management device which will also help manage power from other sources including regenerative braking systems, thermoelectric devices that convert waste heat into electricity, or solar panels. All juice will then be sent into the car’s electrical system, further reducing the amount of load on the alternator. As with a conventional shock absorber, the Levant technology relies on a piston that moves through oil to damp down movement. Levant improves on this idea by using a modified piston head which comprises of parts that spin as it moves through the oil, helping turn a small generator housed within the shock absorber. A power controller relies on information from accelerometers and other sensors to change the resistance from the generators, resulting in better handling thanks to automatic stiffening and softening of the suspension. The company currently does not have any plans to manufacture the technology itself, but would prefer to license it to a manufacturer or create a joint venture. if only they can fit this system’s device into ships’ counter-wave technology.. then for every wave ships counter, they get some electricity stored.